Will Microsoft Help Retailers Counter Amazon Go? The tech giant’s cashierless system could help traditional brick-and-mortar retailers. Microsoft (NASDAQ:MSFT) is developing a technology that could eliminate cashiers from stores, according to a Reuters report citing six people familiar with the project. Shoppers would scan their smartphones upon entering a store, sensors would detect items being removed from shelves, and cameras would track the items in the shopping cart. Shoppers' accounts would be charged once they left the store. This setup sounds nearly identical to Amazon (NASDAQ:AMZN) Go, which launched in Seattle this January. In February, Recode reported that Amazon could launch "as many as six" new Amazon Go stores this year. Amazon already stated that it won't install the technology in its Whole Foods stores, but the move still probably spooked traditional brick-and-mortar retailers like Walmart (NYSE:WMT). That's why Walmart is reportedly in talks to install Microsoft's cashier-free technology at its stores. If that test is successful, many other retailers could follow suit and change how brick-and-mortar stores operate. Why is Microsoft copying Amazon Go? Unlike Amazon, Microsoft isn't interested in running an e-commerce platform or retail stores. It wants to expand its commercial cloud services to more businesses. These services include Azure, the world's second-largest cloud infrastructure platform after Amazon Web Services (AWS), and Dynamics CRM, its cloud-based customer relationship management platform, which competes against Salesforce's flagship service. Microsoft's commercial cloud revenue rose 58% annually to $6 billion last quarter -- supported by 93% growth in Azure and 65% growth in Dynamics. The widespread use of Windows and Office, another pillar of Microsoft's cloud growth, makes it easier for Microsoft to cross-sell cloud services to more enterprise customers. Offering an all-in-one package for cashierless shopping could tether many more major retailers to that cloud ecosystem. One of the biggest dilemmas for Walmart is balancing its promise to raise wages with bottom-line growth. In January, Walmart hiked its U.S. minimum wage to $11 per hour, offered cash bonuses, and expanded parental leave benefits -- but also announced store closures and thousands of layoffs. The company's investments in e-commerce -- including its acquisitions of Jet.com and Flipkart -- further weighed down its earnings growth. That's why analysts expect Walmart's earnings growth to decelerate from 9% this year to about 4% next year. 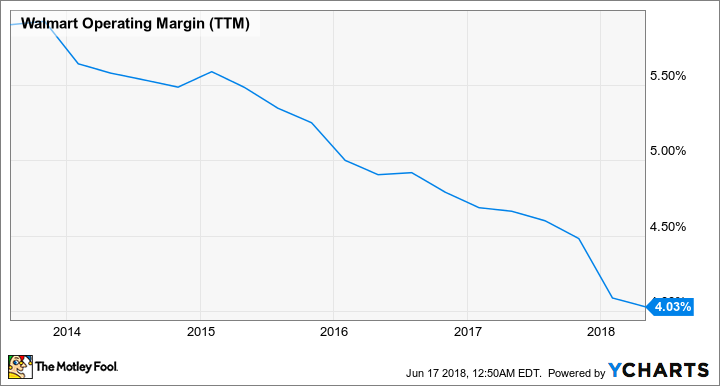 A look at Walmart's operating margins over the past five years summarizes that bleak tale. Therefore, installing Microsoft's cashierless systems at its stores could enable Walmart to significantly reduce its employee headcount and boost its margins. It would also help it gather more real-time shopping data from individual consumers (which it was already trying to do via its Walmart Pay app), that information could help it optimize its store layouts, inventory, and promotions. Amazon clearly has a first mover's advantage in the cashierless market. Moreover, it took Amazon nearly four years to develop Amazon Go, and it accumulated data for almost 14 months before opening its first Seattle store. This means that Microsoft probably can't launch a competitive service overnight. Amazon Go is also currently designed for convenience store-sized areas. Expanding that system of cameras and sensors to Walmart's superstores could be costly and impractical. Certain unpackaged products, like produce, could also be tougher to track. That's probably why Amazon hasn't expanded cashierless systems to its Whole Foods stores yet. Lastly, Amazon could also sell its cashierless system to other retailers, which could tether them to services like AWS and Amazon Pay. Rivals like Walmart probably wouldn't sign up, but smaller retailers might. A cashierless platform could help Microsoft expand its cloud presence and help retailers like Walmart, but it probably won't arrive anytime soon. Meanwhile, Amazon will likely retain its first mover's advantage in the space as it opens more Amazon Go stores across the country.